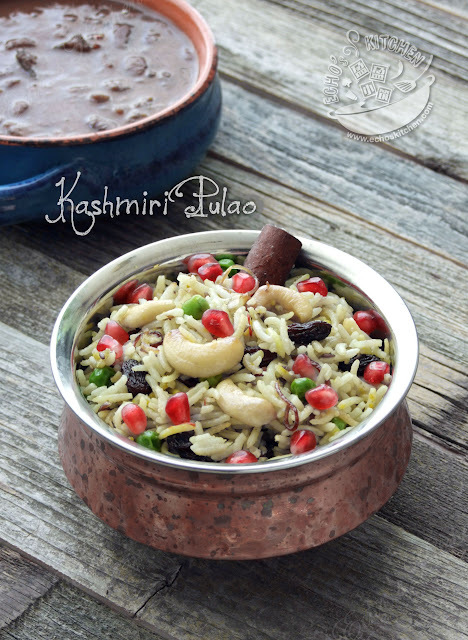 Unlike most Pulaos in India, Kashmiri Pulao is known to be mild, aromatic and slightly to the sweet side. Garnishing with fresh fruits like pomegranate and some dry fruits makes it look so colorful and appetizing. 1. 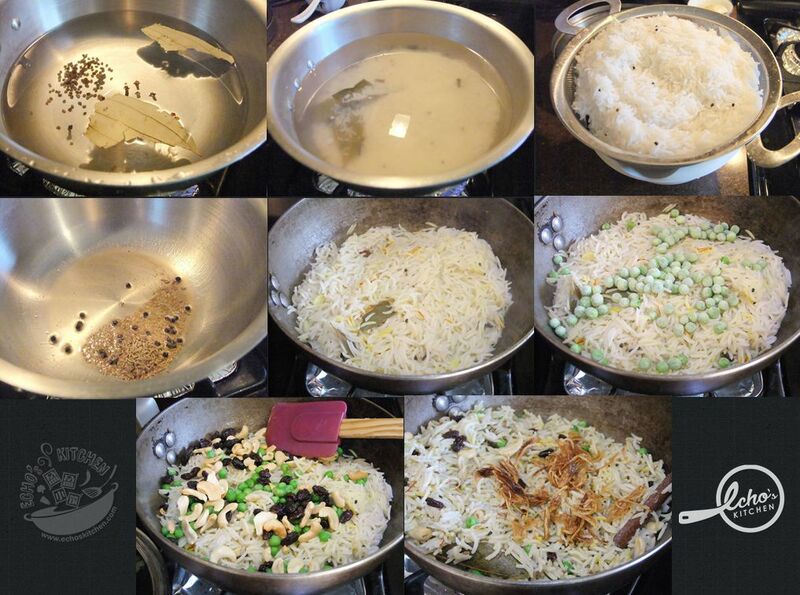 Soak Basmati rice for 20 minutes. Slice and fry shallots until crispy. Warm 1/2 cup of milk and place saffron strands into milk and soak for 20 minutes. 2. 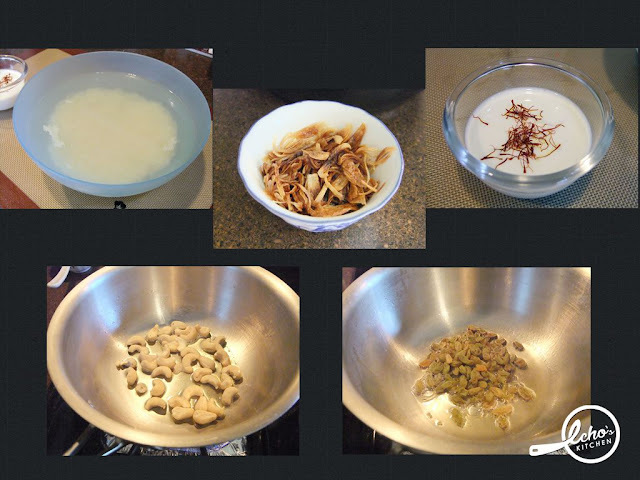 In between, heat 1 tbsp of ghee in a cooking pot, roast cashew nuts until golden brown, take out and set aside. Add raisin and give it a quick stir, be careful not to burn it. Take out and set aside. 3. Bring half pot of water with salt, bay leaf, cloves and cardamom seeds to boiling. Drain soaked rice and add it to the water with herbs and spices, cook for 8-10 minutes. Turn the heat to medium low and cook for 3-5 minutes more or until the rice is about 70-80 % cooked. (The rice should be breakable when presses with fingers, but not soft yet). Drained the cooked rice and leave aside. Note：Cooking time is really depends on the type of rice you have, old rice required more time than new ones. You could try to adjust the cooking time accordingly. 4. Add the remaining ghee into pot, add cummin seeds and pepper corn, stir until cummin seeds cracks. Add rice and milk with saffron, cover with lid and cook for 5-8 minutes, add some salt if needed. 5. Add sweet peas and raisin before turning off the stove, turn the rice well and cover with lid for 5 minutes. 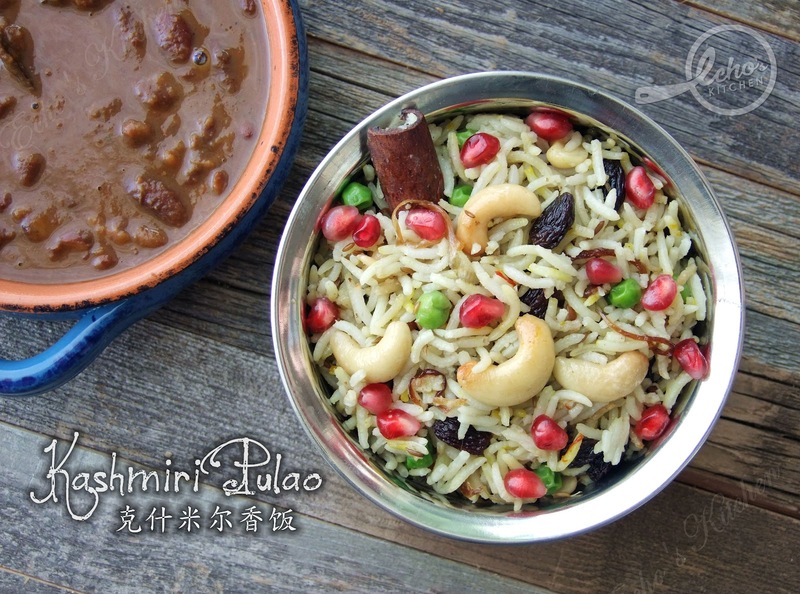 Cashew nuts and pomegranates is to be added before serving so that it stays crunchy. This rice goes well with any dal or curries. I'm an American married to a Kashmiri. Just stumbled across your gorgeous blog looking for a Malaysian curry powder recipe. Great recipes, charming writing & fabulous photos, keep up the good work! Thank you Bibi, and do come visit sometimes!! keep in touch!